The Sombrero Galaxy is one of the most unusual looking barred spiral galaxies visible from Earth. Its bright nucleus, large central bulge and spiral arms threaded through with a thick dust lane make it look a little like a hat from Mexico. The dust lane is a ring that circles the bulge of the galaxy, and it is rich with gas, dust, and hydrogen gas. Because it has all the elements needed for star formation, it’s not surprising that astronomers have found many sites of star formation inside. The Sombrero Galaxy may not be part of a formal galaxy group, but could be a member of a string of galaxies that extends away from the Virgo Cluster. As many as 2,000 globular clusters swarm around the core of the Sombrero Galaxy, and the number could be related to the size of the central bulge. The Sombrero has a central supermassive black hole at its heart. Observations of star motions near the black hole suggest it could have the mass of a billion Suns, perhaps the most massive of any black hole found so far at the heart of a galaxy. 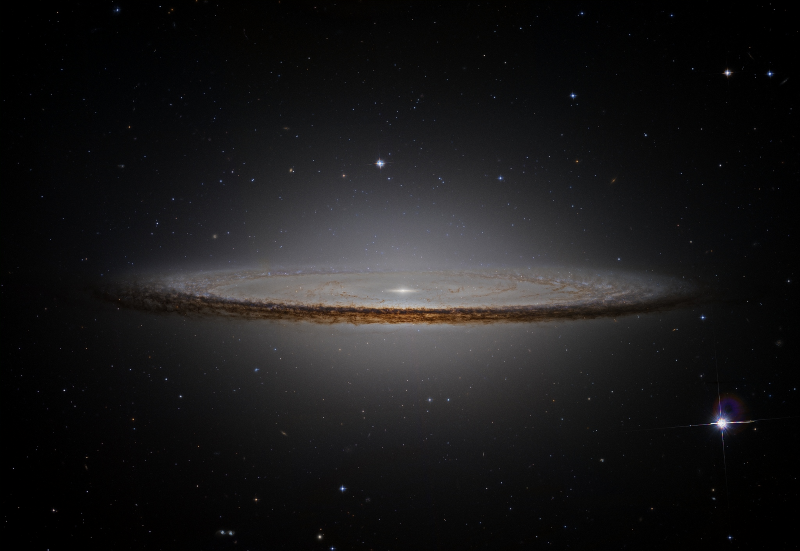 The Sombrero Galaxy is a favorite target for well-equipped amateur astronomers. If you have a good dark-sky sight, it can be spotted through binoculars; those with large telescopes can spot the dust lane. The Sombrero is a spring and early summer observing object half-way between the constellations Virgo and Corvus. NASA’s Hubble Space Telescope and Spitzer Space Telescope have been used to study the Sombrero in visible and infrared light. The starbirth regions stand out in infrared wavelengths are are mostly located along the outer rim of the dust ring surrounding the galaxy’s core. The Sombrero Galaxy looks as it does partly because we are viewing it “edge on” from our point of view here on Earth.